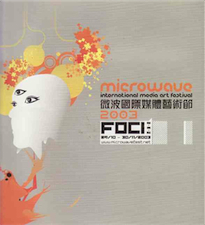 "Strong Enough" (2001, Best Musical & Audience Choice awards at Thaw 02) was screened at the Microwave International Media Art Festival 03 held in Hong Kong, October 29 - November 30. Curated by Ip Yuk Yiu, the festival's international video program screened at the Hong Kong Space Museum November 7-9; "Strong Enough" was featured in the "Audiovision" program. “Microwave International Media Art Festival 03,” Pierre Yves Clouin, accessed April 23, 2019, http://pierreyvesclouin.fr/items/show/254.